The Union’s president, Nuhu Ogirima, who disclosed this at a press briefing, Wednesday,in Abuja, after an expanded national executive council meeting of COEASU. Ogirima, however, said the union will reconvene in January to reassess government’s commitment, warning that it will not hesitate to stay away from work again if the government reneged in the agreement. “The government through the Minister of Education, has met with state governors over poor and non-payment of salaries in states colleges,” he added. Ogirima said government has agreed to release a white paper tagged: dual mode’ to implement partially for some colleges to award degrees. The COEASU’s action came at the time Academic Staff Union of Universities, ASUU,was being faced with inconclusive meetings with government even as its strike over similar demands was still lingering. 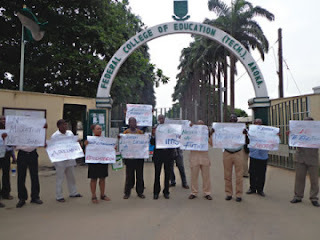 Also, the action of the teachers of the nation’s colleges of education came when polytechnic teachers had threatened to embark on strike. Recall that the polytechnic lecturers under the umbrella of Academic Staff Union of Polytechnics,ASUP, had warned that they may downtool next week.